Our staff are pet owners, too, and understand the importance of keeping pets healthy and happy. We take a personal interest in each patient and value clients as friends. Our veterinary team emphasizes wellness care, yet has the experience and technology to treat problems if they occur. We welcome all family pets and provide nose-to-tail care throughout a pet's lifetime, with a particular understanding of aging animals. Our doctors have daily phone times so you can talk directly with them, a time- and money-saving benefit. Our AAHA accreditation sets us apart and assures that MAH has the team, technology and facilities to deliver the highest quality of veterinary care. Have a non-urgent question about your pet? E-mail us! For fastest response, please call (513) 791-7912. We are located in Kenwood, convenient to Amberley, Blue Ash, Deer Park, Indian Hill, Madeira, Montgomery, Silverton and neighboring communities. Dr. Fairhurst is a graduate of The Ohio State University College of Veterinary Medicine. He works to ensure that MAH maintains its prestigious AAHA accreditation, which it has earned continuously since 1950. 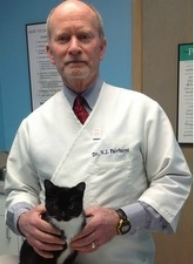 In his early teens, Dr. Fairhurst, owner and hospital director, planned to be a veterinarian. It's a decision he has never regretted even for one day of his 40 years of caring for - and about - family pets. Dr. F is committed to maintaining the hospital's long history of comprehensive, high-quality veterinary care and client service and has staffed Montgomery Animal Hospital with a knowledgeable, compassionate and dedicated team who share his focus. He and his wife have three children, three grandchildren and share their home with two neurotic cats. In his spare time, Dr. F enjoys golf, hiking, travel and running. Growing up in Georgia, Dr. Schlasinger was surrounded by pets - multiple dogs, cats, rabbits, gerbils, mice, even a lizard. Not surprising that at 13 she knew she would be a veterinarian. She began working in a veterinary hospital at 18 and has tackled every job from cleaning cages to answering phones. Dr. S realizes the bond we share with our pets is significant - often stronger than a relationship with another person. Shortly after earning her veterinary degree, Dr. S moved to Cincinnati where she met her husband. Together they have two little girls and one furry four-legged friend, Gracie, a golden retriever mix. Dr. S enjoys spending time with her family, particularly on boating trips to Lake Cumberland. Dr. Krumanaker is a graduate of Princeton University and The Ohio State University College of Veterinary Medicine. In addition to dogs and cats, she treats birds, reptiles and small mammals. Dr. K imagined becoming a veterinarian when she was just 5 years old. She worked for several small animal clinics before pursuing her dream and earning her medical degree. Dr. K loves handling animals of all shapes and sizes and finds particular satisfaction in helping maintain the bond between people and their pets. She volunteers with Pets In Need, a Cincinnati non-profit that provides veterinary care to pets living in low-income households. Dr. K and her husband have two children and a shelter dog named Cooper. She has a passion for all outdoor activities like running, hiking, rock climbing, and gardening. An avid singer, she is a member of the Young Professionals Choral Collective. Kerry, a Registered Veterinary Technician, chose her career because she loves being a part of keeping pets healthy. A bonus is that she also loves the people she works with. As a vet tech, she is the leader of your pet's healthcare team, making sure all diagnostic tests and radiographic imaging are performed properly for best results. Kerry and her husband have a busy household with four children, a collie mix, Gracie, and a tabby cat, Oliver. Together they enjoy trips to Lake Cumberland with family and friends. Kerry is a graduate of the University of Cincinnati, Blue Ash, Department of Veterinary Technology. Kelly is a graduate of the University of Cincinnati, Blue Ash, Department of Veterinary Technology. Kelly is a registered veterinary technician and graduated from the University of Cincinnati in 2016. She chose her career because she loves animals and grew up around all different kinds. When Kelly was younger her neighbors allowed her to ride and take care of their horses. She grew up with a labrador named Bear. Kelly and her husband, Michael, have three rescue dogs named Mary, Margarita and Buster. Kelly and Michael love to take their three dogs to the park. Lauren, Sam, Katherine, Lindsey, and Elora (clockwise from top left, with Elora's rescue pup Josie) are members of your pet's healthcare team, working behind the scenes by assisting doctors and technicians and keeping the hospital and patients clean and comfortable. Although you may not see them on each visit, your pet sure does. They work hard to make it a pleasant experience for your pet. If your pet could talk, you'd hear about how much attention the veterinary assistants shower on them. There's never a shortage of hugs and pats behind the scenes. Whether in person or by phone, our client service reps want you to feel like a friend. They treat your pet as they do their own. Our friendly client service representatives Cheryl, Kathy, Kelly, and Ann, and Andy and Kashmir (not pictured) are the first members of your pet's healthcare team to greet you and the last to interact with you during checkout. When you have questions, they are the ones who cheerfully find answers.